All website owners wants to know how many times the site is viewed ?. So they create this details in admin panel of their website. You can create daily statistics using php and mysql. The php and mysql allows user to create charts on daily, monthly and charts between two dates. You need to follow the below steps to create daily stats using php. Then you add the number of views to mysql table using php. Add the following code to header of each page in your website. Because header is in all pages. So you can easily calculate the number of views of your website. is select the number of views daily. Now you can calculate the number of views of your website. 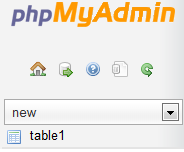 You can create mysql table using php. The following mysql query is used to create mysql table. - mysql_select_db() is used to select the database for use. - mysql_error() gives error message when the mysql query is not running successfully. Now the mysql table 'table1' is created. You can see it in your mysql database at phpmyadmin. Now you created your mysql table.